Brace yourself for endless action with Batman Forever! Batman and Robin blast into Gotham City in a duo player fighting game! Armed with over 125 incredible attacks, fierce combat moves, and an arsenal of gadgets, the Dynamic Duo are ready to battle the diabolical minds of Two-Face and The Riddler! 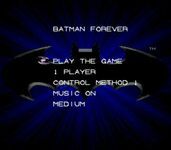 Without question...it's Batman Forever! Real digitized characters and backgrounds! battle holographic villians in the training room! Over 125 awesome moves, gadgets and attacks! Tons of secret rooms and hidden surprises!